The big unification clash in the super bantamweight division took place yesterday and although the fight didn’t live up to its billing, the atmosphere inside the arena was electric to say the least. Barry McGuigan predicted that it would sound like Belfast in the press conferences and he was proved right by the rapturous reception that him, Shane and Carl all received pre fight, mid fight and post fight. Another thing that Barry McGuigan stated in the build up to the fight was that his man, Carl ‘The Jackal’ Frampton would beat Scott Quigg. Once again he was right. Carl boxed beautifully on the back and front foot and didn’t give Scott the chance to land a meaningful shot for most of the fight. When Scott did land a big shot, Carl took it well and got back to his boxing. 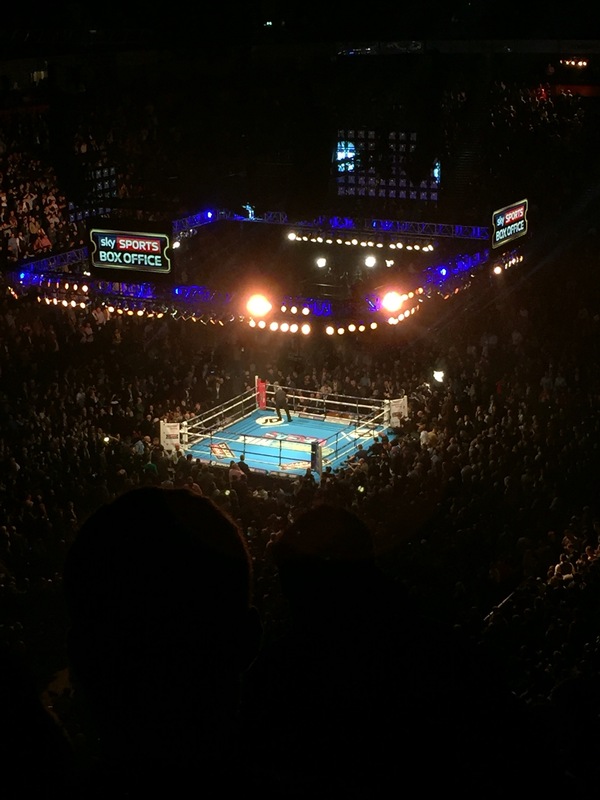 The tactics in the Quigg corner were to bore Carl and get the crowd to jeer so that he would feel the need to push the fight and therefore make mistakes that Scott Quigg could then capitalise on. These weren’t the best tactics I have to admit as The Jackal kept his composure and didn’t fall in to any traps that Quigg was setting. The tactics in the Belfast corner were to faint lots of shots to keep Scott thinking and then hit him with a combination and get out of range. Frampton executed this game plan perfectly and caused Quigg to overthink his work which meant that he wasn’t throwing shots that he was able to land. The Northern Irish fighter even pushed the heavy hitting Bury man back on to the ropes numerous times which the Frampton fans showed their appreciation for. There was a lot of arguing before the fight about who would get the ‘Home’ changing room and it turned out that no fighter got the bigger dressing room and they were both in identical changing rooms which was fair in my eyes. As the fighters made their way to the ring from their changing room they both received mixed receptions but Carl’s was the better of the two. The first 4 rounds were all taken by Frampton in my opinion as Scott was covering up but not landing anything and therefore the aggressor wins the rounds. After the 4th round Quigg started to gain confidence and open up as well as pushing The Jackal back on to the ropes but he smothered his work when in close. His work would of been more effective if he took half a step back and gave him self leverage space to gain power and momentum in the shots. The middle rounds were again won by Carl as he used classy work to hit Scott with a one-two and then switched his attack to Scott Quigg’s mid section which seemed to be very effective. Frampton used his feet extremely well in the bout by pushing out of range when he wasn’t willing to throw as well as after he had thrown which meant that Scott was left reaching with shots and not landing anything. The final 5 rounds were the best of the fight from a fans point of view as both fighters tried to take the centre of the ring and we’re both looking to land big shots to discourage their man from coming fight. It seemed that none of these shots were having an effect on either fighter as they continued to trade body and head shots. One word – Warriors! Coming up to the 12th round Carl was oozing confidence and rightly so after his performance in the early rounds. He made the final round of this huge event his by countering Quigg’s onslaughts with right hands and left hooks to the body which Quigg happily accepted and carried on walking the Northern Irish fighter down but not successfully. With all the rounds complete it was a common feeling in the arena that Frampton had secured the WBA belt to accompany his IBF strap and won the grudge match clearly but this suddenly changed when the legendary MC Michael Buffer announced that the IBF Judge had Quigg winning with a score of 115-113. 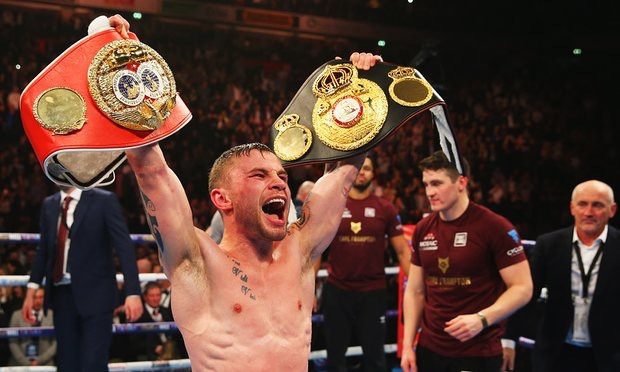 However when Frampton’s score of 116-112 was announced and then repeated by the third judge, the crowd knew that the fighter taking the belts, the pride and the bragging rights home was The Jackal, Carl Frampton. 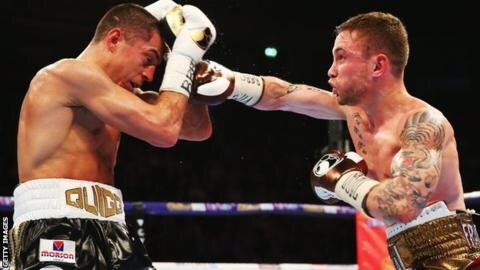 After the fight, Quigg expressed that he thought he had won the fight as in the early rounds he wasn’t taking any shots and they were hitting his gloves but his promoter Eddie Hearn admitted that he thought that Frampton had secured the win by 2 rounds when the final bell rang. Quigg also announced that he had broke his jaw in the early rounds of the fight which shows the grit, determination and mental strength of the Bury man as he carried on fighting with a less than normal size jaw. The win saw Frampton unify the Super Bantamweight division. The big question is where does he go from here? Rigonduex is the WBA mandatory challenger and Shingo Wake is the IBF mandatory challenger so Carl and his team need to defend against both of these before he chooses to fight someone else in this division. However Frampton’s trainer, Shane McGuigan admitted that he wants Frampton to fight Leo Santa Cruz next but that would mean him moving up to 126lb to the featherweight division. Frampton has told the media multiple times coming up to this fight that he has no problem making the weight so there is no need for him to move up. An even more interesting question from the night is where does Quigg go from here? Does he move up in weight? Does he try and get the fight with the WBO Champ Nonito Donaire or does he go down the WBC route to fight Julio Ceja. If he does go down the WBC route he will have to fight Gavin McDonnell, to get in to a mandatory position, who also won on Saturday to go up to #5 in the rankings. Quigg has expressed his interest in the rematch with Frampton but I don’t feel that the fight warrants a rematch as it was so one sided and if I’m being honest, it wasn’t an action packed war which people want to see again. As some of you may know I predicted a Quigg stoppage late on in the fight and I was pleasantly surprised with Frampton’s performance as he showed class and quality to nullify Quigg’s work. Both men deserve respect for getting in there and putting everything on the line to entertain the fans!